The image of a snake biting its own tail (Ouroboros), is one of the oldest symbols known to mankind. The image of Ouroboros is familiar to many, but few know that is this symbol. The exact date and place of origin of the Ouroboros is impossible to ascertain, but it is possible to compare the number of historical treatises and describe the value of this ancient symbol. A snake swallowing its own tail (Ouroboros) is an ancient symbol of the cycle of natural phenomena, the cycle of death and rebirth, eternity and the Universe. In Ancient Egypt the Ouroboros was considered the guard of the underworld, so his image can be found on the tomb walls. The image associated with infinity, death, and rebirth symbolized the daily return of the sun to the sunset point from where it went in the afterlife. In Ancient Greece, the Ouroboros symbolized the cyclical nature of natural phenomena, the unity of opposites, destruction and creation, life and death. From legends and myths of Ancient Greece it follows that the Ouroboros was also associated with the afterlife world. The body of the Ouroboros associated with the infinity of the universe, and the space, which is encircled by the serpent with the Cosmic Egg. In Ancient China, the snake biting its own tail, called Golongan. The animal is portrayed as a cross between a snake, dragon, and pig and tied him to the afterlife. The first figure Julong found in 4700-2900 years BC, she was on the breast of the dead man. The space around which sbivaetsya body Galanga associated with "Dao" – the way of man, the highest state of being. In Norse mythology, the serpent swallowing its tail, is called Ermengarda. This serpent was born to the giant's Angrboda and the God Loki. According to legend, the serpent was supposed to destroy the world, so he was thrown into the ocean, where he grew to gigantic proportions and surrounded the land, biting its own tail. The serpent was considered a symbol of darkness and destruction. In the Bible snakes are regarded as dangerous and evil beings, the servants of the devil. Ouroboros pagan Christians associated with the serpent-tempter who persuaded eve to eat the fruit of the tree of knowledge of Good and Evil. Christians symbolized the Ouroboros with the finiteness of the material world, believing that the body of the serpent delineates its boundaries. In Buddhism, the Ouroboros symbolized the course of life (bhavachakra), the wheel of existence. In this context, Ouroboros were given a very positive sense, was an embodiment of completeness, perfection of the life cycle. Curled up in a ring, the serpent held back the chaos. Snakes with dual body symbolized the unity of spirituality and the impermanence of life. In Gnosticism Ouroboros was a symbol of the endless cycle of metamorphosis, combining good and evil. In one of the Gnostic treatises, it was stated that the body of the serpent consists of twelve pieces, symbolizing the months of the year and the astrological cycles of life. Snakes were associated with the infinity of time and the cyclical nature of existence. Fitzkee some sects worshiped the Ouroboros, since it has given man knowledge. Alchemists believed Ouroboros symbol of the cyclical process in which the heating, evaporation, cooling and condensation of the fluid contribute to the process of cleansing items and transforming them into a philosopher's stone. 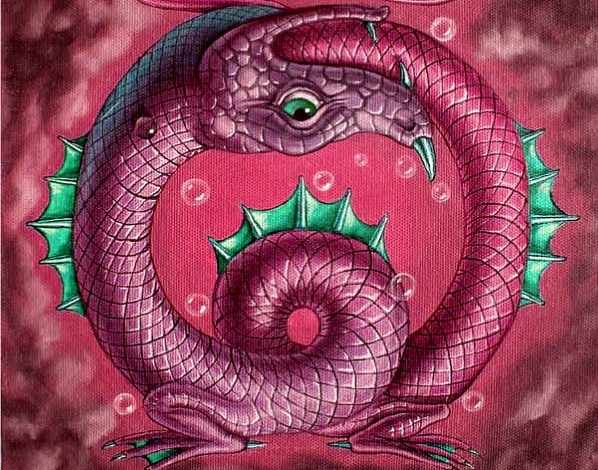 To the alchemists, the Ouroboros was a symbol of transformation, rebirth, transformation, the four elements.